After a fifteen year break, Midnight Oil is back together! 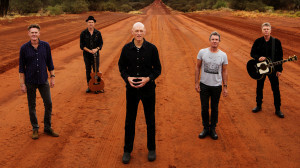 The legendary Australian rockers, lead by 64 year old frontman Peter Garrett, have embarked upon The Great Circle World Tour. The tour kicked off in South America last month and is nearing the end of the North American leg tonight at the Wiltern Theater in Los Angeles. This is no typical reunion tour, you know, the kind where a band plays the same seventeen tunes in order night after night. The Oils have rehearsed practically their entire catalogue and play a different set (23 tunes) each night. They’ve already introduced more than seventy different tunes on their tour so far, if you count a few warm up gigs in their home country to start the tour. Doors swing open at 7pm. All Our Exes Live In Texas is scheduled to open. The Shins – North Park Theater – San Diego – Tonight!